A warning has gone out for people - and their pets - to stay off ice, after several fatal accidents in America. Spells of relatively warmer weather has caused areas of frozen water to thaw and freeze and more than 10 fatal or serious accidents have already been reported, says charity The National Drowning Prevention Alliance (NDPA). Executive Director Kim Burgess says, "We urge everyone to stay off all frozen bodies of water. The perceived recreational benefit is simply not worth the risk to yourself or your loved ones." Gerald M. Dworkin, a water safety and rescue expert and NDPA board member, says most emergency calls are sparked by people trying to rescue their pets from frozen bodies of water. "It's also important to prevent pets from roaming onto ice. More than half of ice emergency 911 calls are triggered by people trying to save a pet who fell through ice. Never attempt to rescue an animal yourself, but rather, call 911. "Ice seldom freezes uniformly. It will be thinner when it has formed over moving water, and where it surrounds partially submerged objects." (i) Fresh, clear ice is stronger than ice that has been covered with snow or has been thawed and frozen again; (ii) anyone falling through the ice should first kick their legs to move them behind their torso before pulling themselves out; (iii) when out the water, the victim should not stand up, but roll away until they are around 15-feet away from the break; (iv) it is useful for those on the ice and rescuers to carry ice picks; (v) rescuers should get someone to call 911 and try to find a buoyancy aid, such as a jug with a rope attached; (vi) if a rescuer has to go onto the ice, they should distribute their weight as widely as possible. 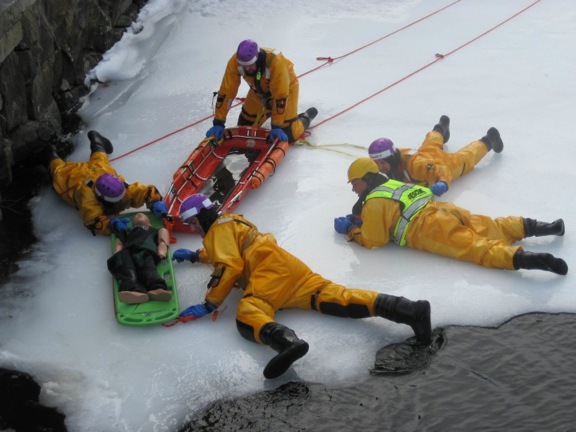 "All first responders should be trained and equipped for ice rescue. Ice rescue suits, ice picks, water rescue rope, and an animal control stick are the minimum equipment needed," Mr Dworkin adds. The NDPA provides advice to people of all ages to help prevent drowning accidents. For more details, go to its website at: www.ndpa.org.